Today was rather strenuous. We built two clotheslines and worked all day on washstands and so forth. For one water container, we swiped a 200 gallon P-47 belly tank from the Jap junk yard. Removed a spigot from our water tank and swapped it for a ¾” inch plug from the bottom belly tank. Hauled some scrap lumber from the Army sawmill down the road. Interesting arrangement. We drew some necessities from the mess hall. Half a dozen bars of tropical chocolate, carton of cigarettes, toothpaste, soap, etc., all free. Carl Snyder developed the pictures we took the other day. Not much good, too small. Inanimate objects were all OK. A few crash pictures, a couple of a new Jap Oscar. A couple taken of the boys in the shower, nearly indiscernible. Johnson and Burke came over in the evening and we indulged in a good long bull session. Columbia old times, you know. Quite interesting. They are coming after me tomorrow night for to see the picture show at the 3rd Attack Group theater and to soak up their ration of beer. Just one trouble, the beer will be hot instead of cold. They told me of the many crashes of A-20s in their outfits. Also of some of the characters over there. Photograph courtesy of the W. N. Swain photo collection. One called Two Gun Brown. (Wears two guns in shoulder holsters). A flying fool who took a plane up to 10,000 feet feathered his two engines. When he got back to his base, he said it wouldn’t fly without power.1 One major in the outfit will ground any man who buzzes the control [tower] for a week yet takes off and blows the roof from it himself. Strictly nuts I hear. After the two boys went home, Snow, a fellow from Denver and I went to the squadron up the hill, drank a cup of coffee and listened to the news. Snow is about as pure a man as I’ve ever known. Darn nice fellow very religious and quite straight laced. Quite interesting to talk to. And so to bed! Believe me when I say that just a minor blip on the life and times of my good friend and dad’s favorite pilot James L. “Two Gun” Brown. Jim was probably one of the most skilled A-20 pilots in the SWPA. Crazy but good! 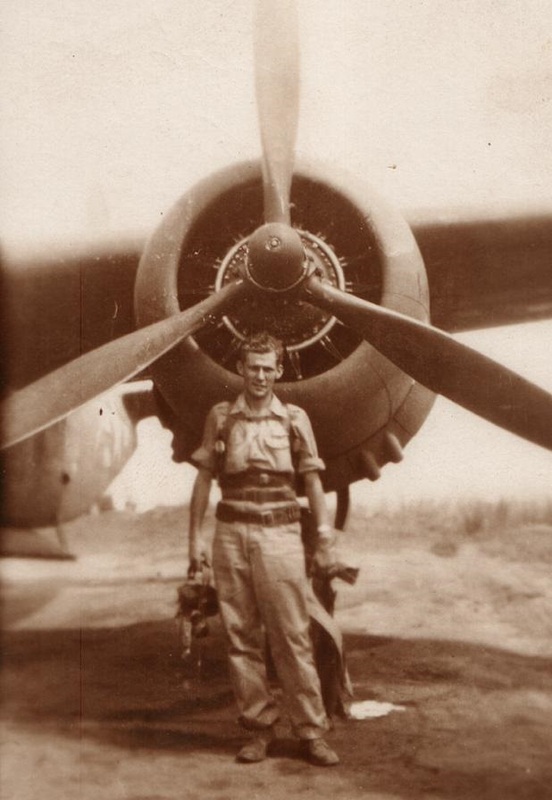 He completed over 100 missions as a co-pilot on B-25s and as a pilot on A-20s. If you ever read about Black Sunday in the SWPA, Jim was one that got himself and my dad back to base under some of the worst weather that the 5th ever ran into. His A-20 was named, “BUB’S BROTHER”, after his brother who was killed at Anzio. The 42nd Bombardment Group, 75th Bombardment Squadron lost a B-25 to a similar weather situation on 05 June 1944. Wayne’s Journal. (https://waynes-journal.com/2014/06/04/june-5-1944/). This entry was posted in Uncategorized and tagged 3rd Attack Group, 3rd Bombardment Group, beer, belly tank, Burke, Carl Snyder, cigarettes, clothes line, coffee, Columbia Army Air Base, Denver Colorado, Oscar, P-47, Snow, soap, toothpaste, tropical chocolate, Two Gun Brown, washstand, Willard Ray Johnson. Bookmark the permalink. This highlights the ingenuity of the men in trying to obtain even the simplest of pleasures in what must have been awful conditions and extreme weather let alone the threat of attack. A20 proved to be a versatile and successful aircraft, I believe also known as Havoc / intruder. Not sure of the difference though. “Havoc” was the aircraft name; intruder was on of its missions. The Douglas A-20 was operated under the following designations: DB-7, A-20, Boston, P-70, and F-3. Over 7,000 Douglas A-20s were produced with the French initiating the first order in February 1940. The A-20 was operated by armed forces of France, the United Kingdom, Australia, New Zealand, Canada, South Africa, the Netherlands, Brazil, the United States, and the Soviet Union, the largest operator of the A-20. For a discussion of the A-20 and its use in various theaters, see Larry Dwyer’s article “Douglas A-20 Havoc” at The Aviation History Online Museum (http://www.aviation-history.com/douglas/a20.html : accessed 14 August 2014). For an extended discussion of the development and many variants of the A-20 aircraft, see Dan Alex’s “Douglas A-20 Havoc / Boston Light Bomber / Night-Fighter” at Military Factory.com (http://www.militaryfactory.com/aircraft/detail.asp?aircraft_id=186 : accessed 14 August 2014). Thanks for the information and links, I shall take a look. Surprised to see the Soviet Union was the largest user, quite an eye opener. Thanks again. The Soviet Union was a major user of aircraft produced in the United States. Besides the A-20, they also received quantities of the P-39. There is much history here that during the Cold War was forgotten or ignored. So very true. Thanks again. I believe that everyone should learn about the Lend-Lease. It was enormous strategic operation that gave foundation for the Allies’ victory in the World War II. Even Stalin publicly confirmed it. It seems to me that when Lend Lease aid is mentioned, people say “Oh yes, the stuff we gave to England”. Few people know of the tremendous assistance we provided to the Soviet Union. One has only to read the following and think of the significance of supplying 400,000 vehicles alone. “. . . the US deliveries through Lend-Lease amounted to $11 billion in materials: over 400,000 jeeps and trucks; 12,000 armored vehicles (including 7,000 tanks, about 1,386 of which were M3 Lees and 4,102 M4 Shermans; 11,400 aircraft (4,719 of which were Bell P-39 Airacobras) and 1.75 million tons of food. Roughly 17.5 million tons of military equipment, vehicles, industrial supplies, and food were shipped from the Western Hemisphere to the USSR, 94% coming from the US. For comparison, a total of 22 million tons landed in Europe to supply American forces from January 1942 to May 1945. It has been estimated that American deliveries to the USSR through the Persian Corridor alone were sufficient, by US Army standards, to maintain sixty combat divisions in the line. I was in the USSR at that time and I know very well that without the Lend-Lease the USSR could not stop Nazis at Moscow and Stalingrad. My Grandmother’s brother was KIA August 14, 1944. Found this while looking for info. Interesting read. I will be back often. I have always been interested in the period. He was a Canadian Gunner. I found an article once that was a detailed accounting of the day…wish I could find it again. I admire Brown for his dash and youth. I see them as young boys these days behind the wheel of a 500 hp Mustang. Indeed, the gun butts facing forward are quite a sight.